Spring has purportedly arrived. Just days ago we had an 80ºF day. Followed by a morning of sleet and freezing rain… But it is spring nonetheless and time to inject a little colour into your wardrobe. You certainly don’t have to go as far as I did in the photo above, but I was making a point. And I work, for the most part, at home. And by now, people hereabouts tend to cut me a little slack when it comes to matters sartorial. 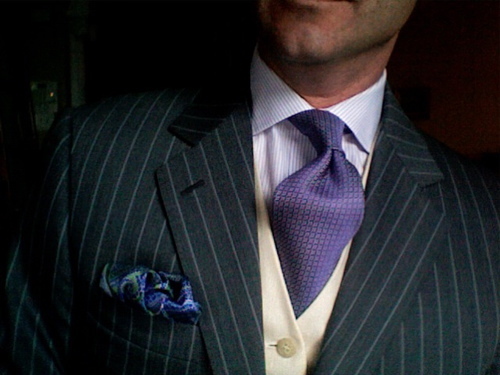 Despite the loud stripes, the light grey material, the lavender striped shirt and darker tie, ignoring the lime green and purple pocketsquare, what probably stands out most in the photo is my cream linen vest. Which is actually very sedate compared to the rest of the Easter egg colours I’m wearing. In fact, that’s where I found mine, on the Champs Elysée, several seasons ago. I dug it out today because the suit is a very lightweight one, 8 ounces at most, and the day is gloomy, damp and hovering around 50ºF. That’s where the odd vest shines. Now you could achieve the same warming effect by layering a colourful lightweight sweater or sweater vest under your suit, but it lacks the impact of a real, button up, pocketed odd vest. But let’s say that you are just not ready to reveal your inner peacock, but you are feeling just a little bit dandy. Are you wearing your grey suit? Does it have stripes? That’s the colour you’ll pick up in the vest. A white sweater vest against a patterned light coloured shirt and slightly darker tie would be a smart combination. (I used the cream to actually tone down the lavender hues and tie the stripes in the suit and shirt together.) Another tried and true look from the fifties and sixties pairs a dark coat, white shirt and dark tie with a red vest to very good effect… call it the first Robin of spring look. A yellow vest or sweater would look handsome right now, injecting a little sunshine into the dreariest of days. And you can’t go wrong with a classic camelhair under just about anything, especially if it’s a blue blazer and olive slacks over suede shoes. Reconsider adding a vest, instead of just a brighter tie, to draw out a little colour during these first days of spring. 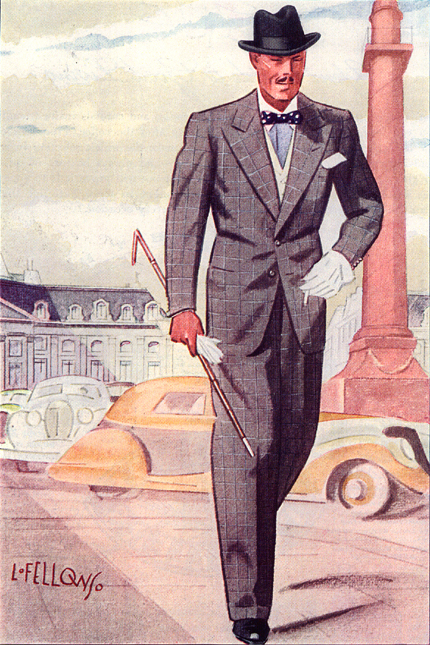 This entry was posted in Elegantology and tagged colour, dressing, Elegantology. Bookmark the permalink. Shall hunt for one for my dandy! Photo is wonderful and illustration too. Very elegant look. I like the entire combination. If you don’t mind, I will be stealing your “Men in Style” picture and using it as the wallpaper on my computer. Also, those are lavender stripes in the suit, correct? I like it even more. please forgive me, I tagged you from a to z.
love to see your easy and elegant list. ATBB, I’m flattered, thank you. Sart was one of the reasons I began this little venture. Mrs. PVE, I bet you could pull it off, too! I’m working on the responses to the questionnaire. Tricky business that. Is the photo of you reversed, or does this new laptop have dyslexia? Good eye… it’s the camera built into the MacBook. Takes reverse images.